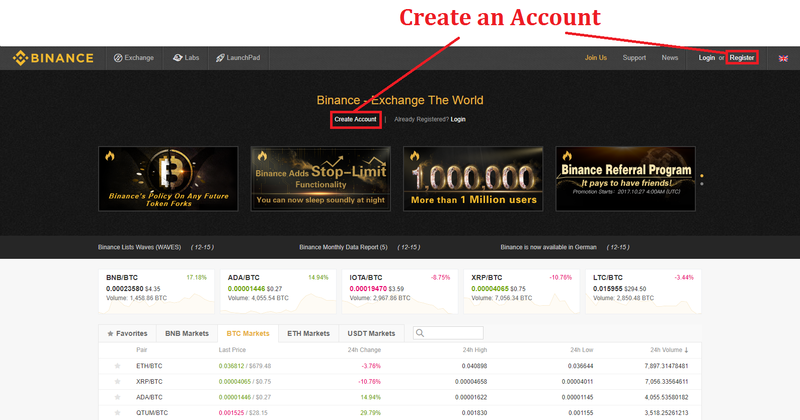 I will present you in this tutorial, how to register to Binance and start to trade your Cryptocurrencies on this Exchange platform. Binance is a new Exchange platform that was launched in July 2017. It's already part of the 5 biggest Cryptocurrency Exchanges in the world, after only a few months. On Binance, you cannot buy Cryptocurrency directly with your Dollars (or Euros), but you can deposit Bitcoin, or any other Cryptocurrency avaible on Binance, to trade it with other Cryptocurrencies. - Transactions fees are low (0.1%). If you own Binance Coin (BNB), the fees are divided per 2 and payed directly with BNB. - Binance is very easy to use, even if you are new to the Cryptocurrency or trading world. - The website is constantly improving, the team is adding a lot of content and the support is quite quick, compared to many other platforms. - Over 100 Cryptocurrencies are avaible for trading. Once you are on the website, it's very easy. Click on "Register" on the top right or on "Create Account" in the center of the page. You will have to enter your E-mail address and choose a password. An E-mail with a confirmation link will be sent to your address. You can add an additional security on your Account by activating what we call 2FA (Two-Factor Authentication). 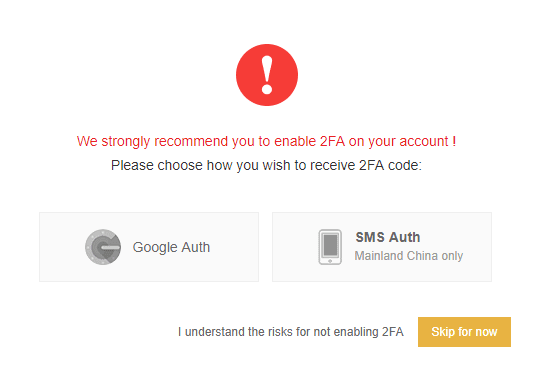 You can activate 2FA on Binance with Google Authenticator (More infos on Wikipedia). You can also click on "Skip for now", and do it anytime later. 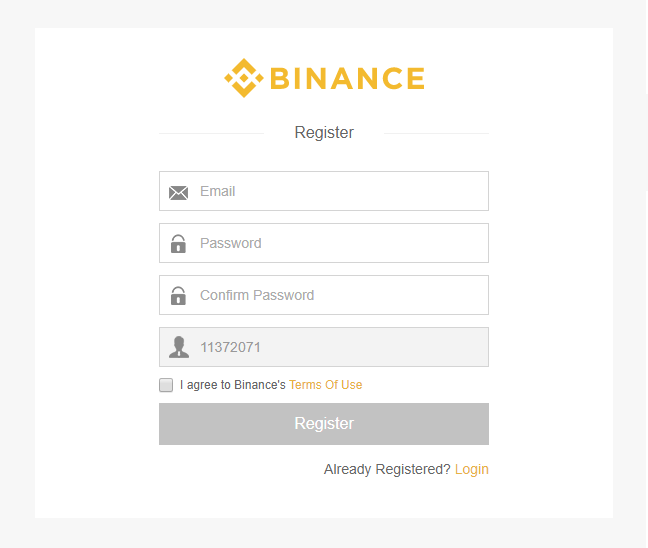 Now that your are registered, you can make a deposit on your Binance Account. You can deposit Bitcoin or any other Cryptocurrency that is avaible on Binance. You will have to click on "Funds" on the top of the page and choose "Deposits Withdrawals". Here, we will choose to deposit Bitcoin.You have to click on the "Deposit" button that is on the right side of the currency you want to deposit.You can search for a currency with the search tab on the top left. Once you clicked on "Deposit", you will see the Deposit Address on which you can send your currency (Here we deposit Bitcoin). You have a different address for every Cryptocurrency, send only Bitcoin to your Bitcoin address. Now that you have made your first deposit to Binance, you can start trading Cryptocurrencies. Click on "Exchange" on the top left of your screen, and then choose between Basic and Advanced. I advise to use "Basic" if you are not familiar with trading. You first have to choose the Market on which you want to trade, on the top right (Red on the picture). You can trade Cryptocurrencies against Bitcoin (BTC), Ethereum (ETH), Binance Coin (BNB) or Tether (USDT). In this example, we will choose BTC.Just below, you can see the list of currencies that you can trade for BTC. Click on the currency you want to buy or sell. It's also possible to search direclty the currency you want (Orange on the picture).You can see the choosen currency on the top left of the page (Green on the picture), and the actual price just beside.On the bottom of the page, you have the tab where you can buy or sell the currency you selected (Blue on the picture). There will be more details on the next picture. 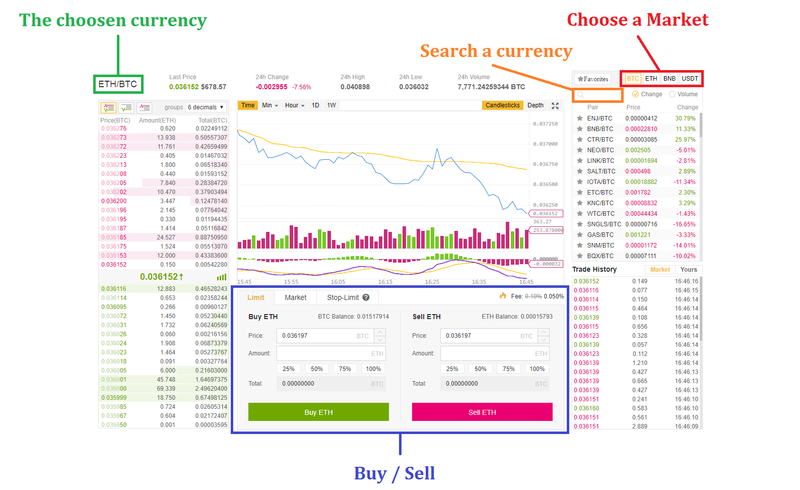 In this example, we will buy Binance Coin (BNB) with Bitcoin (BTC).You got 3 choices :- Limit : Choose your price- Market : Buy/Sell directly at actual market price- Stop-Limit : Fix a price for a Buy/Sell order in advance. 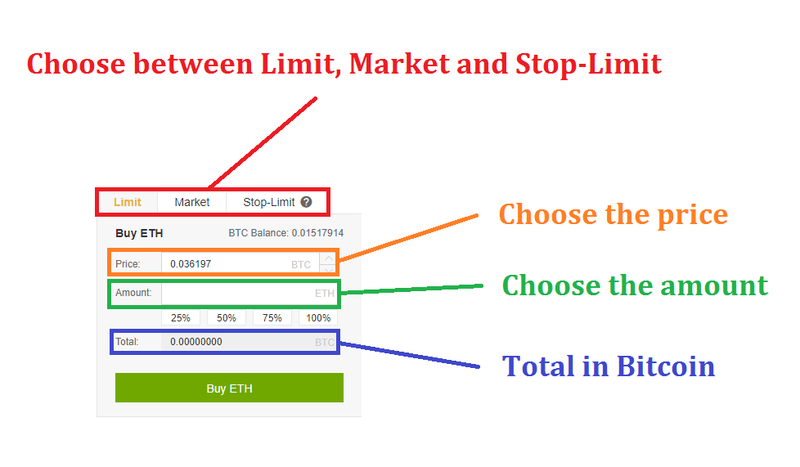 If you choose "Limit", you will have to put the price, and then choose the amount you want to buy (or sell). With "Market", you just need to enter the amount. You will then see below the total amount of the order (Here in Bitcoin). We will see the "Stop-Limit" more in details on the next picture. The Stop-Limit allow you to fix a price from which you are ready to buy.- Stop will allow you to fix the price, from which your order (Limit) will be automatically be submitted.- Limit is your Buy/Sell order, that gonne be submitted once your price has reached the Stop. I have 1 Binance Coin (BNB), the price is now at 0.000200 BTC. Let's say that I bought it at 0.000100, so I got a x2 on my investment. To be sure, I would like to sell it automatically if the price drops under 0.000150 BTC. I have to put 0.000150 in Stop and for Limit I will put a bit less : 0.000148. In amount, I put the number of BNB I want to sell (Here 1). If the last price is equal or less then 0.000150 BTC, my Sell order at 0.000148 will be automatically submitted and this could help me to limit the losses. It's also possible to do the same for a buy order. To make a withdrawal, you just have to get back to "Funds" on the top and then "Deposits Withdrawals". Click on the Withdrawal button on the right of the currency you want, and enter the address where you want to send. The daily withdrawal limit is 2 BTC / day (or equivalent in other Cryptocurrency). You can upgrade the limit to 100 BTC / day after filling a few informations and prove your identity with a Identity card or Passport. You know now how to use Binance and you can start trading Bitcoin for other Cryptocurrencies.